As expected, the Legacy of the Void (LotV) is announced in Blizzcon 2014. However, there are more unexpected than expected. LotV will be an independent game instead of an expansion that requires Wings of Liberty (WoL) and Heart of the Swarm (HotS). This is simple yet brilliant. I doubt many have expected this because we are so confined with what have been done with Heart of the Swarm that we expect more or less the same. From a business perspective, this fits well with the current Starcraft model or one time payment. I don’t think players who do not have any of the previous two expansions if LotV requires the them. At the same time, those who already own the first two expansions will buy it anyway. Further, new players who have experienced LotV may go back to buy WoL and HotS. To a certain extent, you can even call this Starcraft 2.5. This is interesting. Two players share control of a normal single player. It is more of a fun mode which is less stressful than the standard one versus one melee. It is easier for true casual players to play once in a while with friends. Also, you can use this to teach new players to focus on certain things. Not much has been reviewed but it sounds like an arcade style game. More incentive for casual players to buy the game. Compared to the other two, this is more for the serious RTS players. Automated tournament mode is something that has been requested by the community for a long time and it is great to see it being implemented. It is like the resume from replay feature introduced in HotS. Good job Blizzard. This is perhaps the most drastic change in LotV. By reworking the fundamental economy of the game, everything changes. The general concept of the game changes as there is more incentive to expand constantly since the mineral patches get mined out quicker. This changes the three-base-economy paradigm that part of the community has been highly critical about. It is too early to judge that the new economy system is an improvement or not. Every build order we know now will no longer be applicable. The changes from HotS to LotV will be much more extreme than what those were from WoL to HotS. You no longer build your first Supply Depot at 10 supply, that’s for sure. Oh, no more 6-pool too. It is an opportunity to change race. I may just do a Classic. This is a very daring change, which can make or break the whole game. Everything you see is not confirmed. However, there are already so many “imba chant”. Most importantly, it is better to start designing new ideas to be overpowered and then tune it down accordingly. Thus, it is normal that everything seems imbalance. 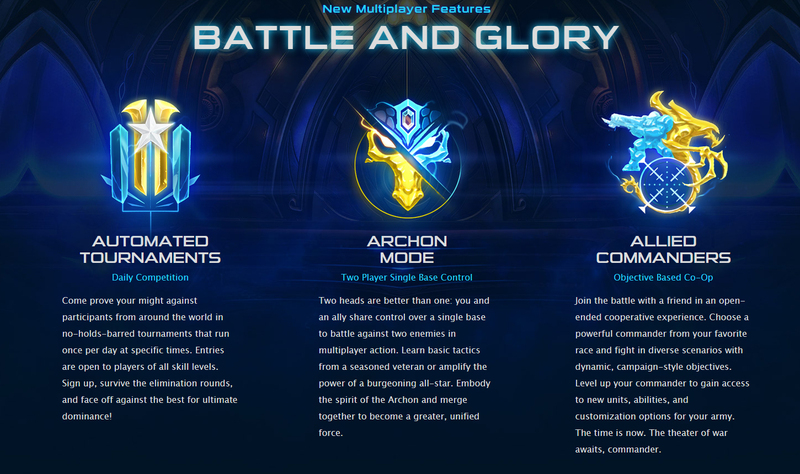 Judging from what I’ve seen from the Archon mode show match, many of the current designs should not get through. Do you still remember what happened to the prototypes of the HotS units and changes? How many of them remain? Very few. Oracle and Widow Mines work completely differently now. Why this particular economy change could be “good”. How you understand/define “good” un this particular case ?! I thought theee is no problem with economy in HoTS. There was this discussion about how the economy of Starcraft 2 indirectly encourage deathball play style. I wrote something related on that here. Click on some of the hyperlinks where the three-base-economy paradigm is being discussed by the community. The rationale behind the economy change is to increase the incentive to expand more. However, assuming it works as intended, I am not sure how all-in will be affected. Further, all builds will be changed, and there will be new all-in. What do you mean about the battle.net platform? Do you mean new features? Yeah same here. I would like to see integrated clan wars. And ofc microtransactions for new soundvoice packs, models for units and for buildings, background wallpapers, decals and portraits.